acon Industrial M.2 2260 SSD is a new SSD module designed for embedded systems applied for industrial platforms. acon industrial 2260 SSD offers a universal temperature range for operation, 0°C - 70°C and -40°C - 85°C and a capacity up to 512GB. 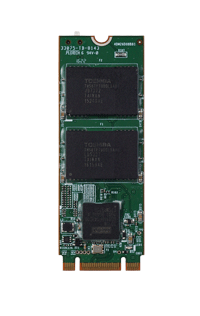 Cactus Technologies Commercial Grade M.2 are reliable, cost effective flash storage devices, based on MLC NAND. They are intended for applications which demand very high performance in a rugged small foot print form factor guaranteed to MIL-810 Standard shock and vibration. Innodisk M.2 (S60) 3ME3 effectively reduces the booting time of operation system and the power consumption is less than hard disk drive (HDD), and complies with ATA protocol, no additional drives are required, and can be configured as a boot device or data storage device.